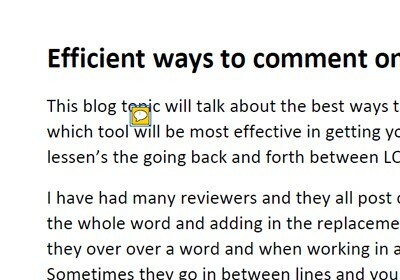 This blog will cover the most effective ways to comment in PDFs for document localization projects. There are many tools to use and it’s sometimes hard to know which one will get your revision comment across without creating confusion. 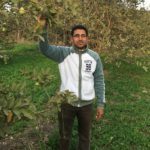 The goal is to decrease the time spent going back and forth between linguistic quality assurance (LQA), desktop publishers (DTP) and the client, which will save time and money. 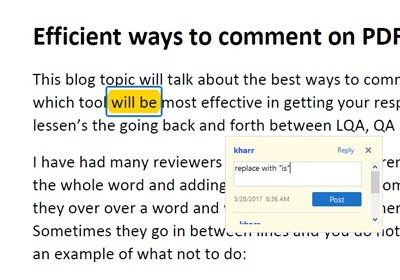 To get started, make sure you have the most up-to-date free version of Adobe Acrobat Reader: https://get.adobe.com/reader/otherversions/. Color coding to differentiate the type of comment can be very effective as well. For example: pink = minor change, green = LQA only and red = major change. Communicate with all team members to ensure they understand what each color represents. 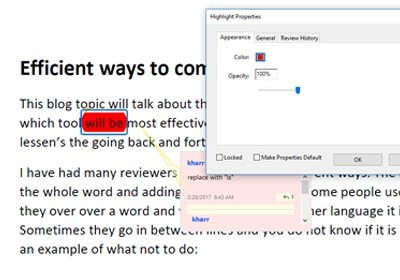 To do this, highlight the word > right click > go to Properties and click change color. Green highlights can be skipped by the desktop publishing (DTP) team and directed straight to LQA, which will cut down on DTP costs. 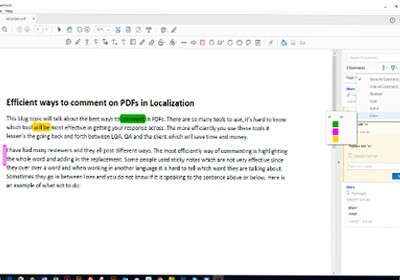 Sometimes documents need to be skewed in order to satisfy language expansion needs, like for English to German translations, but these comments can be highlighted pink since they are minor issues. A major issue that can be marked as red is if a word is truncated or an image is missing. This affects the integrity of the document and must be marked as an alert. Color coding may seem like a lot of work, but you can also color code your comment list so you only see the ones pertinent to you or LQA. 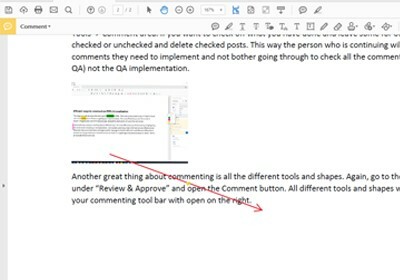 If you need to delete all the red and pink comments and just send green ones to LQA, you can do that in the Tools > Comment area. Another great thing about commenting is all the different tools and shapes that are available. To access these, go to the Tools tab > click on the Comment icon. All of the different tools and shapes will pop up and your commenting tool bar will open on the right. A good example for when to use these would be if you want to move a graphic or image. Instead of putting a sticky note and explaining where the image should go, you can use the arrow tool to show exactly where you want it to go so there is no confusion. As you can see, there are a lot of options in Adobe Acrobat for commenting. Being specific and as clear as possible causes less confusion and going back and forth between different revisions. Document translation projects are already complicated enough due to working with multiple languages and things like translated word replacement are crucial to the readability and credibility of your document.